Christmas magic will be coming to Fleetwood this Saturday with the switch on of the festive lights. The switch-on itself takes place at the Marine Gardens after a lantern parade through the town centre that this year will have some spectacular surprises. The parade is due to set off at 5pm from Fisherman’s Walk/Ash Street with groups assembling there at 4.45pm to see Santa arrive on the Western Train illuminated tram. He will welcome seven lucky ticket-winner school children from each of the town’s primary schools and then climb into a sleigh, loaned by the tow’s Rotary Club for the procession. The Parade, headed by the illuminated tram with children and local dignitaries on board, will also include the Old Boys Band. Joining the procession will be The Willow Garden Project’s impressive 8ft illuminated Snow Queen Lantern and star lanterns. Cast members of the panto Jack and the Beanstalk, being staged at the Marine Hall next month, will walk among the crowds. 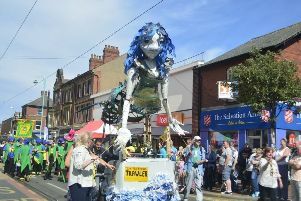 The Carnival Queen with her retinue, youth groups and the public carrying their lanterns will make their way down Lord Street and North Albert Street. The procession will halt at the Euston Gardens where the tram passengers will alight to join the procession to the Marine Gardens where a Christmas concert will take place presided over by local DJ David Scrivener. Fleetwood singer Nicola Hayton will perform, and Shakespeare School Infant Choir will sing traditional carols and songs. The lights switch will then be pulled by one of the seven lucky ticket-winner school children and the Mount Pavilion lights will be switched on by Councillor Terry Rogers.